Next year – 2014 – will be the Year of the Horse on the Chinese lunar calendar; a year of commitment to self-improvement and growth. Next year will also be the 30th anniversary of the founding of L3 Advertising, the nation’s first advertising agency created specifically to help Fortune 500 companies market to Asian Americans. We plan to add a new entry to the L3 blog every fortnight – every 14 days – because it follows the lunar calendar. A fortnight is the distance between the new moon and the full moon. And so, as the moon waxes and wanes, we will come up with ideas and interesting stories to share on our blog. We will cover advertising topics, Asian American insights, as well as interesting things that we’ve been doing lately. If you would like to subscribe to our posts, we’ll send you our latest blog entries when they come out. Speaking of interesting things and fortnights, we recently saw this story about Broad Sustainable Building, a construction company in China that built an entire 30 story hotel in Hunan in just a fortnight! You’ll have to watch the video to believe it. It’s a pretty appropriate metaphor for the meteoric rise of the Asian American market and its emergence as the hottest consumer target in America. Make MetLife the brand of choice when consumers think about insurance. In short, an uphill battle to change consumer behavior from ground zero. We knew that our Asian American target audience only started planning life seriously once they were married and became a parent. An Asian American father will do everything within his might to provide for and protect his child. And so L3’s very first ad zeroed in on this consumer insight. The ad copy elaborated further on how a young life is fully protected only if her parents are also protected. The ad became an instant hot topic and an iconic image in the Chinese community. Before long, MetLife became the financial institution that Chinese parents knew about and talked about. 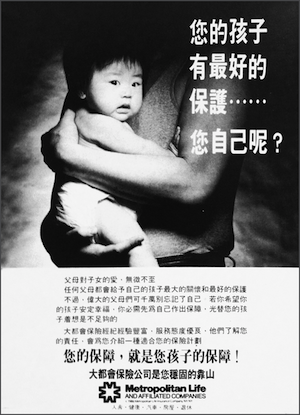 Because of the impact that the campaign had in the Chinese community, the baby ad and its story were subsequently published in dozens of mainstream newspapers and magazines and L3 Advertising’s future as America’s very first Asian advertising agency had officially been launched. The ad visual was actually a photograph of me – a skinny, twenty-something year-old new dad – holding my infant daughter Alexandra. Twenty seven years later, Alexandra is a television director who has shot TV commercials for L3’s clients.